Have you ever been in a situation where you’re rushing to get out of the door, but you realize your clothes for the day are a mess? You rush to plug in your iron only to be forced to wait for it to warm up. Then you rush to smooth your clothes while trying to make sure you don’t burn them. You can avoid this hassle by using a steamer instead. Even though you’ll still have to wait for it to warm up, most steamers reach the necessary temperature in mere seconds. Having the best clothes steamer will shave off significant time when you’re in a rush, so be sure to find the most top-quality models to avoid being disappointed. To get you past the many mediocre steamers on the market, we’ve compiled clothes steamer reviews on some of the best models available. What is the Best Clothes Steamer on the Market? Quick Summary of This Guide: If you want to find the best garment steamers for specific applications, single out the greatest models for home and professional use. If you’re in need of a high-quality steamer to use around the house, the best home clothes steamer is the Jiffy J-2000 as a powerful unit that lasts for over an hour per fill. The J-2000 can also be used for light commercial use. If you have more demand for professional applications, the Jiffy J-4000 is the best steamer for this purpose. It is corrosion-proof and features a water level gauge that indicates build-up of sediment within the device. It also features preheating settings that can give you customized steam on demand. 1 What is the Best Clothes Steamer on the Market? 15 Where Can I Buy a Steamer? When your steaming needs are simply those around the home, you can opt for a quality home steamer without too many functions or frills. Home steamers provide many benefits over ironing, and they’re often very affordable. They heat up quickly and can be used to straighten clothes while they’re still hanging. You don’t have to worry about burning any surfaces or even scorching your garments. Home steamers can also be used to clean and deodorize other fabrics such as bed linens and curtains. They work well for straightening materials that would be too dangerous when using an iron. Handheld steamers offer the benefit of being portable, so you can carry them around the house as you need them. You can also carry them along to or from your home or business if necessary. This makes your steaming sessions even more convenient as you aren’t limited by the weight or short cord length of a standard machine. Most handheld steamers are very compact, so they also offer the benefit of saving space compared to larger models. Because they fit in the hand, these steamers tend to feature comfortable grips and operational components. Handheld steamers are more portable, so they’re made to use quickly when on the go. This means that the best fabric steamers in this category are quick to heat up as well. Professional steamers are made to handle more heavy-duty tasks on a larger scale. They usually have greater functions and more capabilities compared to other types due to the need for more advanced performance. Professional models are the best clothing steamers if you need to use them for long periods. Most of them feature large-capacity tanks that allows for 1 to 2 hours of steady use. The types of steamers are also built to be stronger than average models. They are made with durable materials that will enhance longevity of the device. Because of their larger size and longer use, professional steamers should also be ergonomic and comfortable to operate, and they must be easy to use and easy to move around. Travel steamers are some of the best models available when it comes to general versatility and application. While they can be used like standard steamers, they also offer the benefits of portable and handheld models. These steamers are made to function like a typical machine, but they are compact enough to be stored away easily when you travel. The most important difference between standard portable units and travel steamers is the dual voltage feature of the travel version. Dual voltage capability allows travel steamers to be used with power supplies all over the world, so they are ideal for those that travel to many different places on a regular basis. Travel steamers also come with many accessories to make your steaming quicker and more convenient. The J-2000 is a great steamer for home use, but it also works well for light commercial applications. It’s Powerful The unit provides 1,300 watts of steaming power, so you can be sure it will offer a performance you need in any situation. This applies even if you steam on a frequent basis. Efficient The J-2000 can provide 1.5 hours of steaming per fill. It features a ¾-gallon water tank that provides more than enough water for your steaming sessions and fits securely to the steamer’s base. It Operates Quickly The unit can heat up in only 2 minutes to provide you the ability to steam as soon as you need it. Can Be Transported Easily The J-2000 is made with durable high-impact plastic with swiveling wheels for easy mobility. It’s very easy to take it along in addition to being sturdy. Safe to Use The unit has an automatic shut-off feature that reduces the chance of unnecessary hazards if you forget to turn it off. The Conair GS28 is a simple and easy-to-use device that allows you to remove wrinkles from clothes, clean upholstery and kill dust mites and bed bugs. It features a 5-foot fabric hose along with a T-nozzle to allow for easier reaching and better coverage. 1500 Watts of Power The Conair GS28 is more powerful than many of its competitors in this regard. Short Warm Up Time The steamer heats up in just 45 seconds to be ready as soon as you are. Long Operation Time It has a steam time of 1.5 hours for every filling of water. Convenient The unit comes with clips to steam your pants as well as a rotating hanger to store and steam a variety of other garments. Empty Release Valve This helps make finishing and cleaning much easier. The Rowenta IS6200 is a compact garment cleaner made to handle full-size tasks. Its an affordable model that still has features that allow for application as a powerful home steamer in addition to that of a commercial unit. Powerful Steaming The IS6200 features high steam output along with wide diffusion to make removing wrinkles faster and more efficient. Easy to Move Around This unit has a suitcase-style roll and tilt function that makes moving and storing very easy. Ergonomic Some of the most useful features of this model include its soft handle and fabric-covered hose made to stay cool, its lighted foot-operated switch and its telescopic pole that adjusts the height of the garment and collapses for storing. Transparent Reservoir The is the best steamer for monitoring water levels. Its water reservoir uses standard tap water and allows you to see how much of its 81-ounce capacity remains while in use. This powerful 1500-watt steamer is an energy-efficient model that features an on/off button, double-insulated hose and easy-to-fill removable water tank. It can heat up in as little as 45 seconds to give you strong and efficient steaming as you need it. Powerful The best clothes steamer should be powerful, and this steamer offers 1,500 Watts of power to provide a continuous supply of steam to straighten wrinkles in various fabrics. Safe Operation Its safest features are the handheld power button, a long 6.5-foot power cord and automatic shut-off when the unit overheats and/or runs out of water. Temperature Control A 4.6-foot insulated hose helps keep the ideal steam temperature in addition to regulating surface heat of the hose. Water Tank The water tank is removable for easy clean-up in addition to being translucent to allow monitoring of water levels. It holds 1.65 liters of water and provides over 55 minutes of steam. Convenient The unit features a built-in hanger, a fold-down hanger for small garments and hanging clips and side hooks. The PureSteam XL offers superior steam output to remove wrinkles in your clothes, bed spreads, upholstery and more. The steam can help to deodorize numerous fabrics and kill bed bugs and dust mites within them, and it makes a great unit for residential or light commercial use. It comes with a garment hanger and brush attachments to make steaming easier. The PureSteam XL will leave your garments fresh and crisp while still being gentle on delicate items. Strong The 1500-Watt unit is powerful enough to handle a variety of tasks. Quick The steamer warms up in as little as 45 seconds for quicker steaming operation. Easy to Refill Consumers in clothes steamer reviews love its water tank. It features a large removable half-gallon water tank that allows for mess-free filling. Efficient The unit offers up to 60 minutes of constant steaming with each fill. Mobility Rolling casters help to easily move the unit as necessary. The PureSteam portable steamer can be used to remove wrinkles from upholstery, bedding, clothing and linens. It’s one of the best handheld steamers when it comes to being safe for nearly all types of fabric. This model features an improved nozzle design that helps distribute the steam consistently. Unlike ironing, you’ll find yourself appreciating how quickly you can get out the door or even enjoying the experience. Compact Design The unit’s small design allows for easy storage and travel. Fast Operation Steaming can begin within 2 minutes of powering on. Safety Automatic shut-off protects the steamer and the surroundings if the unit overheats or gets low on water. High Capacity The easy-to-fill water tank provides enough water for 10 minutes of constant steaming. Versatile An included 8-foot power cable eliminates the need to power the unit through an extension cord. The Shark GS500 offers professional steam power in a compact and portable device. It features its own unique wrinkle erasing bar that combines pressure with steam to revitalize your fabrics. As one of the best small steam cleaners, the GS500 helps you save money by allowing efficient steaming and pressing at home. Pressing Pad The included pad lets you create a vertical ironing board for more efficient steaming. Cleaning Use the Shark GS500 to kill 99.9 percent of germs and allergens on contact when cleaning. You can steam your way to deodorizing and sanitizing fabrics and garments. Versatility With its pressing pad, the unit can remove wrinkles like an iron, but it still offers the portability and performance of a compact steamer. Power Cord Its 15-foot power cord allows flexibility to take the unit where you need it without concern for outlets. The Rowenta DR8080 is considered by many as the most powerful handheld steamer available. It’s a fast and powerful unit that comes in handy in a hurry. When you can’t wait for an iron to heat up or don’t have time to put in the effort to iron out wrinkles properly, the Rowenta DR8080 is a great option. It’s the best compact steam cleaner when speed is the priority. Speedy The DR8080 has a fast start time with only 45 seconds needed to heat up for operation. Powerful It has the power of a full-size steamer in a portable design. With 1,500 Watts of power, it features a steam trigger for continuous steam and steam burst options. Steam Distribution It features a micro metal steam head that provides for even steam distribution through ports and a stainless steel sole plate. Auto Shut-Off The unit has an automatic shut-off feature to prevent overheating or hazards. Design The unit is made to be comfortable with an ergonomic handle design. Jiffy is one of the best handheld fabric steamer brands, and its Esteam aims to provide all of the benefits of a personal steamer while also being portable. It has a small size that is no more burdensome than a travel thermos, and this makes it very popular among frequent travelers. When traveling for business or other ventures, you don’t want your clothes riddled with wrinkles from your luggage. Versatile The Esteam was designed to use different plug attachments that can accommodate diverse power sources in the US and Europe. Its the best clothes steamer to use on the go as it can even plug into a car AC outlet. Durable The unit is made with a high-impact plastic outer housing. Size The Esteam is compact and lightweight to easily be carried anywhere. Selection You can buy the unit in both black or pink to suit personal tastes. Safety It features cool-touch housing and automatic shut-off to prevent injuries and accidents. The Stella model is the best handheld clothing steamer for convenience. It can be used for steaming, sanitizing or deodorizing nearly any of your fabrics including shirts, pants, dress, upholstery and more. You can freshen your fabrics without using expensive or harsh chemicals. The Stella steamer is powerful enough to get jobs done even with the toughest wrinkles. The incredible handheld steamer is easy to use, features a drip-free reservoir and comes with a fabric brush and refill cup. Fast Operation The unit heats up in just one minute to allow you to get started quickly. High-Capacity Tank Even as a compact steamer, it features a reservoir of 7 ounces. Easy Steaming The Stella is one of the best steamers for handheld use due to the steaming time. It provides 12 full minutes of continuous operation with each fill. Effective The Stella steamer eliminates wrinkles like a professional. Power Cord The compact steamer offers greater mobility with its extra-long power cord. Jiffy is known as a leading manufacturer in steaming equipment, and the J-4000 steamer is one of the best professional steamers on the market. This model is the brand’s most powerful one designed for commercial use. It has a built-in and easy-to-read water level gauge that is also capable of indicating the accumulation of sediment in the device. It features a 1500-watt heating element along with a stainless steel steam chamber. The J-4000 provides preheat and steam settings that allow you the convenience of having steam on demand. It takes 15 minutes to reach a preheating temperature and just five minutes to achieve full steam. Long-Lasting Two hours worth of steam for each filling. Durable The unit is made with die-cast aluminum housing. Safety Wiring This feature turns the unit off temporarily when it runs out of water. Boiler Tank Made of corrosion-proof stainless steel. No water lines that can become clogged. Dual Thermostats Dual thermostats provide steam in seconds. The Rowenta IS6300 is also well-known as another one of the best professional garment steamers available. You can quickly eliminate wrinkles from nearly any type of fabric, and it works great for clothing, upholstery, linens and more. The 1550-watt full-size unit features roll-and-press vertical support to keep your clothing in place. It can also be used for sanitizing, eliminating dust mites and removing smoke, food and other strong odors from furniture and other fabrics. Steam Head The unit features a large steam head that emits powerful high-volume steam. It provides wide diffusion for quicker and more efficient results. Comfortable The handle is made to stay cool even when in use, and it has a flexible fabric hose. Large-Capacity Water Tank The IS6300 features an extra-large transparent 81-ounce water tank that provides one hour of continuous use when fully filled. It removes for easy filling and allows you to complete tasks without having to stop and refill in the middle. The Salav GS45-DJ professional steamer is among the best commercial garment steamers on the market, and it’s set apart by its power and features. It can tackle heavy garments, furniture and drapes as well as delicate upholstery due to its multiple user settings. The unit is also easily mobile due to over sized casters that allow it to roll over various surfaces. Boiler The GS45-DJ features a corrosion-resistant aluminum boiler that heats faster, saves energy, lasts longer and is environmentally-friendly. It resists residue build-up and features lateral drains that prevent excess water from affecting the heating element. Capability The 1500-watt unit is strong enough to provide a powerful flow of steam after heating for just 45 seconds. Large Water Tank The removable 1.8-liter large-capacity water tank is translucent and provides up to 60 minutes of steaming time per fill. Insulated Hose Users in clothes steamer reviews appreciate the long 4.6-foot hose that is double-insulated to maintain temperature of the steam head while also reducing the surface temperature. Reach Between the long steam hose and the 6.5-foot retractable power cord, the unit allows for more range to electrical outlets along with easy storage. The Elite steamer from PurSteam provides a temperature of 248˚F to allow the steam to deeply penetrate into your fabrics to relax the fibers and remove wrinkles with ease. The unit can be used with many types of fabrics from heavy to delicate, and it helps freshen clothes and kill germs. The PurSteam Elite is backed by a 5-year warranty compared to the 1-year that comes with most models, and it offers a money-back guarantee. Considered one of the best commercial clothes steamers, this unit is a very popular model that is also perfect for home use. Water Tank The unit’s tank has a large capacity of 61 ounces. Quick & Efficient The Elite heats up in just 45 seconds while providing up to 60 minutes of steady use. Sturdy The steamer features a heavy-duty cast aluminum heating element that is very durable. Mobile Wheels located at its base make the unit easy to transport. The Salav GS60-BJ is a powerful professional 1500-watt steamer featuring a 360-degree swiveling hanger. It offers strong and steady steam to soften wrinkles in upholstery, clothing and many other types of fabric. The steamer heats up in as little as 45 seconds and provides over 50 minutes of steam with each fill. Its double-insulated hose helps regulate steam temperature and maintain surface heat. The GS60-BJ features an advanced arc-shaped steam nozzle that provides a continuously strong flow of steam in addition to multiple steam settings. Water Tank The 1.7-liter water tank is easy to fill, removable for easy cleaning and translucent to allow for monitoring of the water level. Multiple Steam Settings This is one of the best steamers for customization as it has four steam settings that help provide the perfect flow of steam for a variety of fabric types. Extra-Wide Telescopic Pole One of the favorite features in professional garment steamer reviews is the wide pole. This pole is four times thicker than the standard steamer pole. It adds safety, strength, stability and protects against tilting. Swivel Hanger The 360-degree swivel hanger makes steaming each side of the fabric easy as it only requires a twist of the hanger. Nonslip Pads Nonslip silicone base pads add greater stability. The Travel Smart steamer from Conair is a highly portable unit that helps you keep your clothes clean and neat wherever you go. It’s the best portable steamer for more complicated tasks as it allows you to steam at any angle for up to 10 minutes at a time. The steamer can also be stored easily thanks to its folding handle. Worldwide Use The unit provides dual voltage that makes it useful as you travel around the world. This unit is the best travel steamer for those that travel on a regular basis and need to freshen their fabrics as they go. Multi-Angle Operation This is the best clothes steamer for tight situations. The Travel Smart steamer can be used at any angle to provide versatile steaming without many obstacles. Handy Accessories The unit comes included with a removable bristle and lint brush to help you tidy up your clothes even further after or before steaming. Ten Minute Steaming The portable unit can steam clothes or other fabrics for 10 minutes at a time with each fill. The Vornado brand is well known for innovative fans and air circulation appliances, but they put the same technological development and quality into steamer products as well. The Vornado VS-410 is regarded by many as the best travel clothes steamer due to its fast heating, powerful performance and dual-voltage capability. This model is compact enough to fit in a suitcase or backpack while still being powerful enough to quickly and effectively remove wrinkles. Power The 700-watt unit produces a powerful and steady flow of steam. Speed It only requires two minutes to heat up and create steam. Water Tank Despite its compact size, the 5.6-ounce water reservoir can produce steam continuously for 10 minutes per fill. Steam Ports The unit features seven steam ports to evenly distribute steam across the head. Maintenance The VS-410 is the best portable garment steamer with accessories as it comes with packs of CleanCycle crystals that help reduce mineral build-up to increase the unit’s life. The PurSteam Elite features improved steam channeling that provides the ability to more evenly and powerfully eliminate tough wrinkles. Some consider it the best portable steamer for clothes, drapes, tablecloths and many other linens. The company claims that despite typical appearances, this model’s aluminum heating element is superior to that of any of its competitors. It’s the only travel steamer with BPA-free ABS/PP, and this feature is praised by buyers in clothes steamer reviews. This is the best travel garment steamer for those that are conscious about the materials in their appliances, and the ABS/PP combination makes it much more durable. Water Tank The high-capacity water tank is easy to refill and it provides 12 minutes of constant steaming. Quick Heating It heats up quickly in just two minutes to provide wrinkle-removing steam. Long Cord The unit features a 9-foot 3-prong cable that prevents the need for extension cords. Safety Automatic shut-off offers protection in the event of overheating or low water. Even if you have expensive clothing, your pants and shirts will look like any standard garment if they’re riddled with wrinkles and unwanted creases. If you’re like most people, you don’t enjoy spending too much time smoothing your clothes over the ironing board. Clothes steamers and irons are used for the same essential purpose of removing wrinkles from clothing. Both devices can utilize steam to help with this purpose, but they still work very differently. A clothes steamer is used to straighten clothes and smooth out wrinkles in other fabrics without the use of a metal plate. This helps tidy clothes and kill germs without the risk for burning the fabrics, and they can also be used in a vertical position. The benefit of the orientation in which a steamer is used is that it can easily be used to clean, deodorize or smooth curtains, furniture upholstery and bed linens when necessary. Clothes steamers provide lots of versatility by comparison, and they may be easier to use for those that can’t move too much. An iron is a handheld device that transfers heat from a metal surface to a garment or other fabric usually placed across an ironing board. The hot surface of the iron smooths the fabric down flat to retain its shape, and this can be down with or without steam. In contrast, a steamer uses the heat of steam to straighten fabrics while hanging or when placed on a heat resistant surface. Steamers don’t require a board to use as they can be operated in a vertical position. Irons are easy to glide across smooth fabrics, but they can be more difficult maneuvering around sleeves and pleats. They work well for pressing pants, shirts and any garment that should be creased. They are also ideal for heavy and thick fabrics that take more time to smooth. Even the best steamer may not be as effective to straighten very thick and dense materials. One of the downsides of the iron is that it requires a strong ironing board in most cases. This takes up space that some may not be able to spare. A steamer removes wrinkles from clothes without making direct contact with the fabric. The steam wand is held closely to the fabric when used to provide a finished look without the risk of applying extreme heat to the material. These machines work well with soft delicate materials such as silk, satin and polyester. The steamer doesn’t actually have to come in contact with the material, so there is little chance of sticking or burning the fabric. Clothes that are difficult to iron such as printed t-shirts are much easier to smooth with a steamer. They also work well with tricky areas such as sleeves and ruffles. It’s much quicker to steam a garment than to iron it. Handheld steamers are even faster because they are easy to maneuver, lightweight and don’t take up much space. Creases are better made with an iron. Attempting to make creases in dress shirts or slacks will not be as successful as it would with the hot plate of the iron. The best rated clothes steamers can cost hundreds of dollars as a stark contrast to the low price of a traditional iron. What is the best clothes steamer available? This answer will differ for each user, but there are a few standard factors to consider to find the best clothes steamer in general. One of the first factors to consider is the power capability of the device. The wattage and voltage will indicate how quickly the steam can build up and how powerful it will be when released. The minimum for a standard steamer should be 600 watts. Having a powerful steamer won’t mean much if it can’t last down the line. Many steamers have a durable plastic housing, but some may be made of stronger metals. A housing of plastic won’t necessarily mean the unit is of lower quality, and it may be better able to resist overheating. The size and weight of the unit will differ depending on the type of steamer you use. Both factors will also be affected by the other features of the steamer such as its power, portability and water capacity. Steamers are sometimes designed for stationary use and sometimes for carrying back to and from multiple places. Portable units should be compact and lightweight. Even those that are meant to be kept in one place should be easy to move around or store away. When operating equipment involving the use of heat and moisture, having safety features is an absolute necessity. Most steamers will use an automatic shut-off feature that turns the device off when left open or closed for too long. A quality steamer should be comfortable to hold and use with softer accents around the handle and controls. In addition to the steam, the housing of the unit itself may get dangerously hot. Try to find a steamer that mentions having a cool-touch housing element. The unit’s handle should allow it to be held easily when using. You want a handle that’s large enough to make operation easy, but it should be small enough to fold for storage. Whether at home or when traveling, the location of outlets in the room may limit how and where you can use your steamer. Because of this, you want to purchase a steamer with a longer cord length. The downside is a longer cord will make the unit heavier and more bulky. The water tank should be easy to pour into to avoid making messes. An even better water tank will be removable to allow for simple clean up. A water reservoir that has a large opening will obviously be more simple to fill. The more water you can fit into the reservoir, the longer you’ll be able to steam in a session. A decent steamer should have at least an 8-ounce water tank. Even if you have a larger tank, a steamer with a higher wattage will create steam more quickly with a larger flow that will run out more quickly. Some steamers are made to reduce the effects of hard water. It’s best to use distilled water when possible, but still opt for a model that uses wider passageways that won’t clog upon accumulation of lime or other substances. The quality of a steamer and its price usually go hand-in-hand. Because of this, there is a wide price range for steamers, so determine how you plan to balance quality and your budget. If you know how you plan to use the machine ahead of time, you’ll know how to look out for the best features when it comes time to make the purchase. Consider how often you’ll use the machine and the average demand you’ll place on it with each use. Read as many clothes steamer reviews as you can to gain a better perspective of the devices inside and out. You should read reviews from professionals as well as those from fellow consumers to get expert opinions alongside the real experiences of everyday users. Do you want more water in your reservoir, or do you prefer stronger steam? A higher wattage will result in quicker heating and greater steam output, but it will also cause your steam to run out much faster. Find balance between a large-capacity water tank and a middle-to-high level wattage to get the best of both worlds. If you have the means, you may be tempted to go and purchase the most elaborate steamer you can find. There’s no need to get the absolute best clothes steamer on the market if you won’t know how to use it or only plan to use it sporadically. Buy a model that is best for you only in that you can afford it and learn how to operate it. If you can find the models you have in mind in your area, try to take a look before making a final choice. If you can handle them in-person, you can determine which models feel more suitable. You can also compare models physically to help narrow down your choices. Can I use standard tap water in my steamer? Yes. Any normal clean water will allow the steamer to perform its normal function. For best results, try to use distilled water as often as possible. This will prevent the likelihood of sediment build-up from the minerals and other substances present in most tap water. Why should I use a steamer? Steaming can be up to five times faster than ironing, and you don’t have to pay as much attention to setting the perfect temperature. The best steamer allows you to avoid the hassles of burning clothing or setting up and returning an ironing board. You should always use fresh water in the reservoir. Steaming with water older than a week may cause a foaming action in the machine. Using older water on a regular basis will facilitate build-up of mineral deposits and clogging in the steamer. Should I put additives in the water? No. You should only use unaltered water in your machine. Additives such as perfumes or salts should never be added to the water in your steamer. They have the potential to clog internal elements of the machine or corrode important components. How can I maintain my machine? Taking careful steps to use the machine properly will allow it to last its longest. Actions you should avoid include using the unit frequently without regular cleaning, allowing it to run dry, overfilling the water reservoir and storing it for long periods without allowing all water to dry. Where Can I Buy a Steamer? One of the significant aspects of bringing a quality model home is knowing where to buy a clothes steamer in the first place. Knowing where to purchase your steamer will help you find a quality model in addition to giving you the chance to compare it to other models you may have in mind. Many buyers opt to shop locally and find a steamer in a nearby store. This offers the benefits of being able to see and touch it in person and compare it to other brands in addition to bringing the unit home as soon as you buy it. For other users, it’s much better to buy a steamer online. Buying directly from the manufacturer will expose you to real garment steamer reviews from customers of the same brand, and you may also receive special discounts during promotional periods. For those looking to find a cheap clothes steamer that’s still effective, buying online from Amazon is the superior option. Like buying from the manufacturer, purchasing from Amazon gives you a multitude of clothes steamer reviews from real users like you. You’re also much more likely to find the same models for much lower prices. 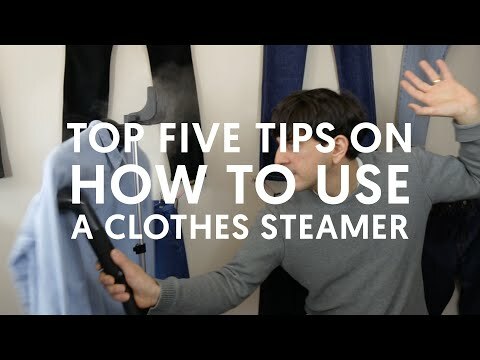 Buying a steamer will significantly help improve the way you tend to your clothes. If you’ve read this guide in full, you should now be more acquainted with steamers than you ever have before. You must use that information to find a steamer model that will serve you well. The result for the best steamer for clothes will be different depending on the household and the individual. The frequency and load with which you use a steamer may make one model more ideal compared to the ideal for another user. Take your own circumstances into account when considering available models, and go on and make the purchase. The best clothes steamer reviews will include information that should help you separate models from one another. Consider all of the features you need, do research on the different steamers available and compare models in fabric steamer reviews to purchase a steamer that will be quick, easy to use and reliable whenever you need it.